The Gila River ( /ˈhiːlə/; O'odham [Pima]: Keli Akimel or simply Akimel, Quechan: Haa Siʼil) is a 649-mile (1,044 km)  tributary of the Colorado River flowing through New Mexico and Arizona in the United States. The river drains an arid watershed of nearly 60,000 square miles (160,000 km2) that lies mainly within the U.S. but also extends into northern Sonora, Mexico. Indigenous peoples have lived along the river for at least 2,000 years, establishing complex agricultural societies before European exploration of the region began in the 16th century. However, European Americans did not permanently settle the Gila River watershed until the mid-19th century. During the 20th century, human development of the Gila River watershed necessitated the construction of large diversion and flood control structures on the river and its tributaries, and consequently the Gila now contributes only a small fraction of its historic flow to the Colorado. The historic natural discharge of the river is around 1,900 cubic feet per second (54 m3/s), and is now only 247 cubic feet per second (7.0 m3/s). These engineering projects have transformed much of the river valley and its surrounds from arid desert to irrigated land, and supply water to the more than five million people, mainly in the Phoenix and Tucson metropolitan areas, who live in the watershed. 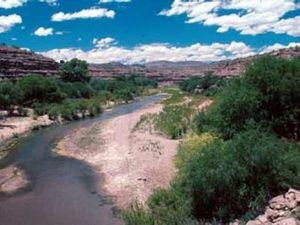 The Gila River has its source in western New Mexico, in Sierra County on the western slopes of Continental Divide in the Black Range. It flows southwest through the Gila National Forest and the Gila Cliff Dwellings National Monument, then westward into Arizona, past the town of Safford. After flowing along the southern slope of the Gila Mountains in Graham County through a series of canyons, the Gila is impounded by Coolidge Dam in San Carlos Lake south of Peridot. It emerges from the mountains into the valley southeast of Phoenix, Arizona, where it crosses the Gila River Indian Reservation as an intermittent stream due to large irrigation diversions. Well west of Phoenix, the river bends sharply southward along the Gila Bend Mountains, then it swings westward again near the town of Gila Bend. It flows southwestward between the Gila Mountains to the south and the Languna and Muggins ranges to the north in Yuma County, and finally it empties into the Colorado at Yuma, Arizona. The Gila is joined by many tributaries, beginning with the East and West Forks of the river, which combine to form the main stem near Gila Hot Springs in New Mexico. Above Safford, it is joined by the San Francisco River and the intermittent San Simon River. Further downstream it is joined by the San Carlos River from the north in San Carlos Lake. At Winkelman, Arizona it picks up the San Pedro River and then is joined by the Santa Cruz River south of Casa Grande. 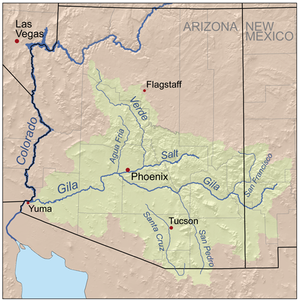 The Salt River, its main tributary, joins in the Phoenix metro area, and further west the Gila receives its last two major tributaries, the Agua Fria and Hassayampa Rivers, from the north. A band of Pima (autonym "Akimel O'odham", river people), the Keli Akimel O'odham (Gila River People), have lived on the banks of the Gila River since before the arrival of Spanish explorers. Popular theory says that the word Gila was derived from a Spanish contraction of Hah-quah-sa-eel, a Yuma word meaning "running water which is salty". Their traditional way of life (himdagĭ, sometimes rendered in English as Him-dak) was and is centered at the river, which is considered holy. Traditionally, sand from the banks of the river is used as an exfoliant when bathing (often in rainstorms, especially during the monsoon). Indigenous peoples such as the Hohokam were responsible for creating large, complex civilizations along the Middle Gila River and Salt River between 600 and 1450 A.D. These native civilizations depended largely on irrigated agriculture, for which they constructed over 200 miles (320 km) of canals. The upper Gila was inhabited by the Mogollon culture over most of the same time period, in settlements like those at Gila Cliff Dwellings National Monument in the later period. The only major dam on the Gila River is Coolidge Dam, 31 miles (50 km) southeast of Globe, Arizona, which forms San Carlos Lake. The Painted Rock Dam crosses the Gila near Gila Bend, although the river is a transient one at that point. A number of minor diversion dams have been built on the river between the Painted Rock Dam and the Coolidge Dam, including the Gillespie Dam which was breached during a flood in 1993. Many dams have also been built on tributaries, including Theodore Roosevelt Dam on the Salt River, New Waddell Dam on the Agua Fria River, and Bartlett Dam on the Verde River. Many major dams in the Gila River system were built and operated by the U.S. Bureau of Reclamation which also constructed most of the large dams throughout the Colorado River basin. Others, such as Coolidge Dam, are owned by local water supply agencies, irrigation districts or Native American tribes. The Gila River between Virden, New Mexico, and Solomon, Arizona, is navigable during spring snowmelt and after summer and autumn storms. The river passes through many scenic canyons and stretches of Class I to III whitewater. Due to its desert surroundings, the river is characterized by erratic flows and flash floods that reach high peaks and drop off just as quickly. The Gila's Salt River tributary has even more difficult whitewater, ranging up to Class IV in places, and often has higher and more dependable flows than the Gila. Boating and fishing are popular on San Carlos Lake and other basin reservoirs, including Lake Pleasant and Theodore Roosevelt Lake. The river system has 36 fish species,  including largemouth bass, sunfish, channel catfish, flathead catfish and Gila Trout (Oncorhynchus gilae gilae). ^ a b c "Gila River". Geographic Names Information System. United States Geological Survey. 1980-02-08. Retrieved 2012-03-16. ^ a b c Kammerer, J.C. "Largest Rivers in the United States". U.S. Geological Survey. Retrieved 2012-03-16. ^ a b c "USGS Gage #09520500 on the Gila River near Dome, AZ" (PDF). National Water Information System. U.S. Geological Survey. 1903–2011. Retrieved 2012-03-16. ^ "The Gila is mostly bone dry in its lower reaches" (Jonathan Waterman, "American Nile: Saving the Colorado", National Geographic). ^ "Boundary Descriptions and Names of Regions, Subregions, Accounting Units and Cataloging Units". U.S. Geological Survey. Retrieved 2012-03-16. ^ "USGS Gage #09432000 on the Gila River Below Blue Creek, Near Virden, NM" (PDF). National Water Information System. U.S. Geological Survey. 1914–2011. Retrieved 2012-03-16. ^ "Gila National Forest (archived)". United States Forest Service. 2003-12-04. Archived from the original on January 11, 2006. Retrieved 2007-10-16. ^ Howard, Jerry B. "Hohokam Legacy: Desert Canals". Pueblo Grande Museum Profiles No. 12. WaterHistory.org. Retrieved 2012-03-16. ^ Hartmann, William K.; Hartmann, Gayle Harrison (1972). "Juan de la Asunción, 1538: First Spanish Explorer of Arizona?". Kiva. 37 (2): 93–103. doi: 10.1080/00231940.1972.11757756. ^ "Rivers and Mountains". Books of the Southwest. University of Arizona. Retrieved 2012-03-16. ^ Turner, Henry Smith (1966). The original journals of Henry Smith Turner with Stephen Watts Kearny to New Mexico and California, 1846-1847. Edited and with an introd. by Dwight L. Clarke. Norman: University of Oklahoma Press. p. 87. ^ Tyler, Daniel (1969). A Concise History of the Mormon Battalion in the Mexican War, 1846-1847. Glorieta, NM: Rio Grande Press. p. 233. ^ Peterson, Charles S. (1992). "Pioneer Settlements in Arizona". Light Planet. Retrieved 2012-03-16. ^ Harvey, Miles, 2000, The Island of Lost Maps. Page 154. ^ "Biological Opinion on the Transportation and Delivery of Central Arizona Project Water to the Gila River Basin in Arizona and New Mexico". Native Aquatic Species of the Gila River Basin in Arizona and New Mexico. U.S. Bureau of Reclamation. 2010-08-30. Retrieved 2012-03-18. ^ Massey, Barry (2008-04-17). "NM governor pledges to fight Gila River diversion". Las Cruces Sun-News. Archived from the original on 2008-06-11. Retrieved 2008-06-04. Benke, Arthur C.; Cushing, Colbert E. (2005). Rivers of North America. Academic Press. ISBN 978-0-12088-253-3. Wikimedia Commons has media related to Gila River.